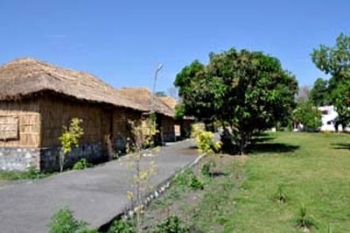 Jeevan Utsav Resort is a paradise in the foothills of Shivalik Himalayan Range near Rishikesh. The resort is an ideal for Corporate Training, Conferences & Retreat. The resort surrounded by Raja Ji National park and Shivalik Hills entry point for Himalayan Pilgrimages 100 mts away from Ganga near Rishikesh is a place where silence meets the soul, where you can leave the hustle bustle of life way behind. Corporate Groups can conduct Conferences and Training Workshop for which our spacious and well equipped Conference Hall is ideal. The hotel also conducts Adventure Tours including River Rafting, Jungle Safari, Rock Climbing, Trekking, Nature Walking & Cycling. The Jeevan Utsav resort is located in the Serene and natural surroundings, just 100 meters from the Holy Ganga and 200 meters from 14 kilometer long Chilla power Canal. Haridwar and and Risikesh are at 15 minutes Drive from the resort. Rajaji National park, Triveni Ghat (Rishikesh), Ram Jhula (Rishikesh), Laxman Jhula (Rishikesh), Har ki Pauri, Mansa Devi Temple, Chandi Devi Temple, Daksha Mahadev Temple are all within 5 to 20 minutes drives from resort. There are 40 well-furnished, fully equipped Rooms with landscaped garden in Jeevan Utsav Resort. The Business Centre has Internet facilities, Audio-Visual Aids for conducting Training Programs, Projector, Printer etc. Day 01: Delhi - Rajaji National Park. ( 230 Km, drive 6 hrs ): Check in Jeevan Utsav Resort at Rajaji National Park. Lunch at Jeevan Utsav. Jungle Safari at Rajaji National Park. Evening tea/soup in the solace of Ganga River Bank. Dinner will be followed by bonfire and dancing activities. Day 02: After breakfast Activities like Rope Pulling by making Teams, Kite Flying, Cricket Match, Photography etc then River Rafting at Rishikesh. Back to Jeevan Utsav for Lunch. or Trip to Vindhvasini Devi Temple - An adventurous way through deep forest and River water. A very pleasant and peaceful place Top of the Hill. Around 200 steps to be climbed for reaching the Temple. Sitting in the calmness and silence of Temple and having tea and snacks at Hill Shops make to feel a very different Experience and peace of mind. Day 02: River Rafting at Rishikesh. Back to Jeevan Utsav for Lunch.After lunch then Trip to Vindhvasini Devi Temple - An adventurous way through deep forest and River water. A very pleasant and peaceful place Top of the Hill. Around 200 steps to be climbed for reaching the Temple. Sitting in the calmness and silence of Temple and having tea and snacks at Hill Shops make to feel a very different Experience and peace of mind..
Day 03: Delhi : After breakfast Activities like Rope Pulling by making Teams, Kite Flying, Cricket Match, Photography etc. Surprise Gifts for the Winners. After Lunch proceed towards Haridwar. Visit to Har ki Poudi and ghats of Ganga and other temples like Saptrishi Ashram. Arrival Delhi and tour ends here. Day 02: River Rafting at Rishikesh. Back to Jeevan Utsav for Lunch.Trip to Vindhvasini Devi Temple - An adventurous way through deep forest and River water. A very pleasant and peaceful place Top of the Hill. Around 200 steps to be climbed for reaching the Temple. Sitting in the calmness and silence of Temple and having tea and snacks at Hill Shops make to feel a very different Experience and peace of mind. Or Sight Seeing like Laxman Jhula, Muni ki Reti, Swargashram, Ganges etc. in Rishikesh. or Rock Climbing for adventure loving. Evening movies in Open Movie Theatre. Dinner in leisure and camping. From Haridwar: Cross Chandi Devi Bridge Take left to reach Chilla Power House ( 7 Km from Chandi Devi Bridge ) From Chilla Power House take Chilla Barrage Road after 7 Km Jeevan Utsav is situated in Ganga Bhogpur Talla on left hand side of the canal. From Rishikesh: Rishikesh Degree college (1.Km before Rishikesh)-Take right turn from Degre college on Rishikesh Barrage Road after 2 Km take left turn on barrage bridge then after crossing the bridge take right turn on Chilla barrage Road after 7 Km Jeevan Utsav is situated at Ganga Bhogpur Talla. Jeevan Utsav Resort is 40 kms from Domestic Dehradun Airport, 20 minutes drive from railway station and 20 minutes drive from Bus stand of Haridwar. Distance from Jeevan Utsav Resort to Haridwar is 17 Km, Rishikesh is 12 Km, Mussoorie is 90 Km, Kunjapuri is 37 Km, Dehradun is 52 kms.